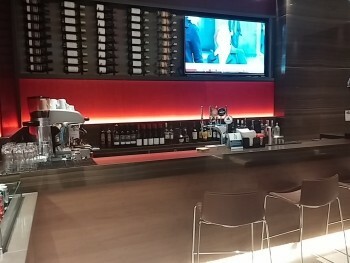 This is our review of the Air Canada Maple Leaf lounge in London Heathrow Terminal 2. Whilst I am away, I am running a couple of pieces submitted by readers. These allow me to cover experiences which I am unlikely to be having myself in the medium term. I have personally reviewed all of the airline lounge at Heathrow Terminal 2 – with one exception! 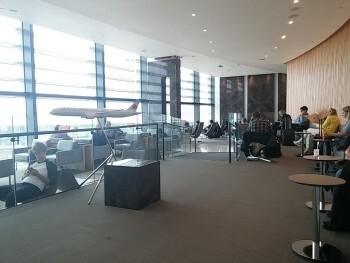 Here is my coverage of the Plaza Premium lounge, United Club and United First (in the B satellite), Aer Lingus, Lufthansa and Singapore Airlines (B satellite). He was generally positive about the lounge, which he found surprisingly large (it is J-shaped). There are three separate seating areas, including the raised space you can see above which gives good views of the apron. Peter caught the end of the breakfast service (sausages, scrambled egg, waffles) and the start of lunch, and was generally impressed. You can see the bar in the picture above. In general, reports on this lounge have been patchy so I’m pleased Peter liked it. My personal recommendations, however, are United Club if you are in the satellite terminal – which has the longest bar in Heathrow, as I reviewed here – and Plaza Premium in the main terminal. You will need a Priority Pass (buy outright or free with Amex Platinum) or Lounge Club (2 free visits with Amex Gold) card to enter Plaza Premium, or pay cash on the door. Note that, unfortunately, the United Club lounge withdrew from Priority Pass last year. Quick feedback on the Plaza Premium departures lounge. They’ve recently signed deals with a number of airlines that mean that the lounge has become more crowded in recent weeks. It’s not as calm and peaceful as it was but I haven’t had any trouble getting in with my Priority Pass yet. “Whilst I am away, I am running a couple of pieces submitted by readers”……..
Clearly you have the editorial prerogative but beware of the slippery slope. look at Pointsguy now – YUK! The few pieces written by 3rd parties in the past have been excellent though, such as Andrew Seftel’s credit card pieces and Nick’s Eurostar series. The lounge is a good place to work and rest. Not food options (they are close to none in the afternoon/evening). There is no attendant behind that bar every time I saw it. If you have *G, the Air Canada lounge is better than the Singapore one – a lot less cramped, and more window space.